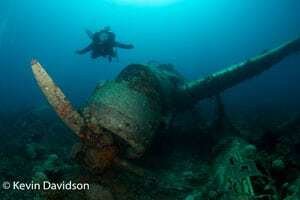 During WWII, Palau was a major Japanese military base. On March 30th and 31st, 1944, US Navy bombers and fighter planes raided the Japanese fleet and sank more than 60 ships and seaplanes in and around the lagoon. Today, Palau, renowned for its beautiful lagoons and thrilling marine action is also the resting place for the “JAPANESE LOST FLEET OF THE ROCK ISLANDS”. Covered by lush marine growth and protected by law from salvers, divers recently discovered the beauty and diversity of Palau’s wrecks. During Wrexpedition 2005, held by Fish ‘n Fins on June 5th through the 10th, research on the IRO was conducted by members of the Japanese government together with Mr. Tomimatsu Ishikawa – one of the remaining survivors. The IRO is 143m. long and was used as a fleet oiler and supply ship during WWII. The Japanese TV Team NHK joined and did full coverage of this special event. Wrexpedition is one of Fish ‘n Fins special annual events which lasts one week and includes 5 days of diving, 3 tanks a day, seminars and optional tech-diving. Between the dives and during the seminars participants have the unique opportunity to watch extraordinary documentaries about WWII.